January is a month where most people decide to get healthy, eat better, exercise more and detox all on a low budget after the excesses of December. So I’ve got a few low cost, tasty, quick meals and snacks to post this month. The first is bruschetta. This delicious dish is one of my favourite meals. Fresh tomatoes, crushed garlic and sourdough bread equals heaven on a plate. Buy the best quality tomatoes you can afford, organic if possible and don’t store them in the fridge, it diminishes the flavour. Bruschetta is a meal you can easily alter to your taste, add basil, red onion or here I’ve added avocado. 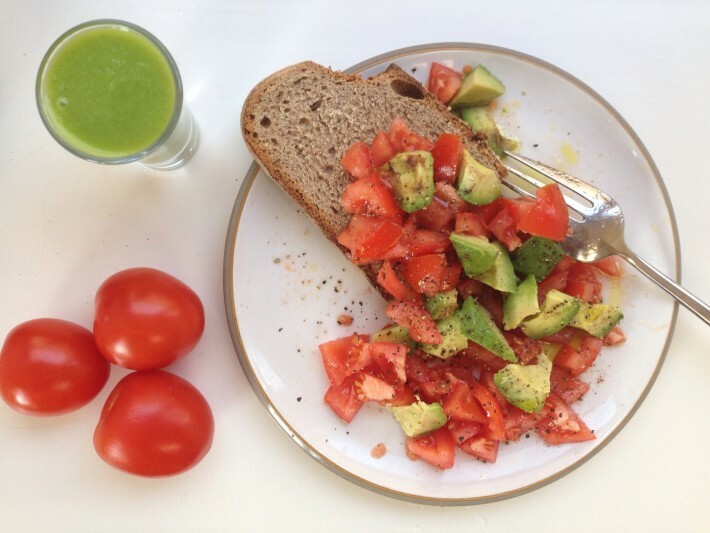 There is little prep other than chopping the tomatoes & avocado and smother over crusty bread. The perfect starter or light lunch. Chop the tomatoes into bite size pieces. Dice the avocado. Mix the crushed garlic clove into the olive oil and apple cider vinegar and pour over the tomatoes and avocado. Finally season with salt and pepper to taste and enjoy with the toasted sourdough bread. Organic unpasteurised Apple cider vinegar is known to have many health benefits. It has antibacterial, antiviral and anti fungal properties. Taking 1-2 tsp daily in water or added to your food as in this recipe has shown to help stabilise blood sugar, may assist in weight loss and helps rid the body of candida – a yeast overgrowth. I use the brand ‘Braggs’ which I get from my local health food store. Some say it helps improve dandruff, whiten teeth when gargled with water, can be diluted and used as a facial toner and aids digestion. I haven’t used ACV yet for cosmetic reasons but when I do I will let you know how I get on. . . Yes this is a crowd pleaser! !